Most people, and island clusters, simply dream about wealth. Then there's Bermuda. The 20-square-mile British territory takes those dreams, adds a gaggle of multimillion-dollar yachts, and turns them into a warped reality in the Middle of Nowhere, Atlantic Ocean. If you've thought about living like the point-oh-1% but can afford only one weekend to roll large, this might be the vacation for you. 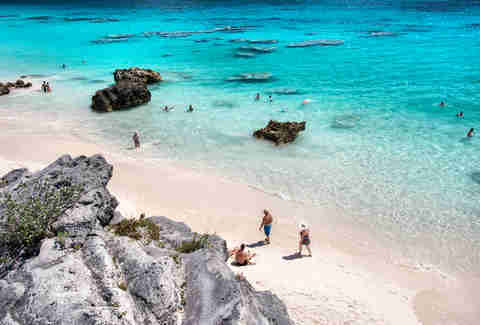 During a recent three-day trip, I learned that a flight to Bermuda might be the cheapest, easiest way to see a true playground-for-the-rich without first having to sell an organ online. There's a reason why most people's knowledge of Bermuda stops and starts at grass and shorts: In Bermuda, the rest of the world is extraneous. While the 65,000-person British territory only sits about a two-hour, $250 flight away from New York City, only 600-odd miles due east of North Carolina, it's not exactly on the top of overworked Americans' must-visit lists. Mainly because said workers usually don't have a trust fund that needs attending. Judging by the numbers, the scant, seahorse-shaped archipelago seems to specialize in two things: making people money, and making people with money happy. It's trying to rebrand itself as a sporty island getaway for the younger set -- more on that later -- but for generations it has been where the words "off-shore" and "haven" get friendly. This perhaps explains why I only lasted 10 minutes on Bermudian soil before a local told me that America, like Bermuda, should do away with income taxes. That's not so unusual in itself, but it was notable, perhaps, that it was my cabbie making this pitch. It's forbidden to rent a car in Bermuda, but you shouldn't really want to drive, anyway. After all, driving is what you do when exploring normal destinations, and Bermuda breaks out in hives at the faintest whiff of normal. As I would come to learn over the course of my visit, the best way to really soak in the peculiarities of this thicket of glut is by walking straight through it. Bermuda breaks out in hives at the faintest whiff of normal. Once you land in Hamilton, the territory's capital and home base, drop your stuff off at a hotel or one of the island's Airbnb properties, whose average $181/night fee makes them demonstrably cheaper than most hotels. Then start your day off with decadent yet easily accessible (those adjectives come hand in hand in Bermuda) horseback ride on the South Shore beaches. There, you'll stare out at miles of azure nothingness, with the only noise coming from your steed treading on the not-white, not-brown, not-black but actual pink sand. 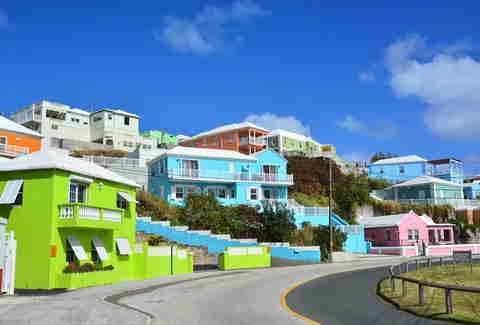 (Yes, even the banal in Bermuda is gem-toned.) You'll understand why Mark Twain, a regular visitor, once said that others could go to heaven when they died but he would "rather stay right here in Bermuda." After you finish your morning canter, an activity that anywhere else would be take-'em-to-the-guillotine excessive, whet your appetite at the Swizzle Inn, an immaculate 1652-built pub named for Bermuda's signature cocktail, the rum-and-juice-based swizzle. As happens in an area whose placeless comforts draw in a truly global class, you're bound to encounter some interesting people whose 70-hour workweeks make them inclined to talk to just about anyone who will listen. At that particular moment, that meant I found myself in a tête-à-tête with the members of Canada's national rugby team, all of them clad in maple-leafed bucket hats and in town for the World Rugby Classic. Once you've thoroughly swizzled yourself, you're going to want to try the wahoo fish sandwich, whose exact makeup seems to be the one source of easily discernible tension among locals. My guides, for instance, debated among themselves for what seemed like hours if I should have the fish sandwich with or without raisin bread, apparently a signature Bermudian take on an otherwise dull bite. Not taking myself, or anything, very seriously at this point -- after all, I was on my third drink which happened to be called a swizzle and in a 17th-century Bermudian pub filled with Canadian rugby players -- I opted for the fish sandwich with raisin bread. And cheese. And tartar sauce. And it was the best decision I made during the trip. If you manage to leave the Inn in one piece, hail a cab and head to Front St, Hamilton's main drag, for prime people-watching. On the way, you might encounter some patently bizarre signage that you'd only see in a place as old and isolated as Bermuda. Stores beckon potential patrons by describing themselves as "trustworthy;" choir gowns and pulpit robes hang behind handwritten signs offering discount liturgical gear (fun fact: Bermuda reportedly has the most churches per capita in the world). Once you step out of the cab, you'll see that locals embody the ambrosial, if not dreamlike, circumstances in which they find themselves: Men pull their pastel-colored socks all the way up to their kneecaps, which they pair with khaki shorts and pastel oxfords ironed so meticulously that you might cut your fingertip on their pleats. Women float about the brick sidewalks in flowing muslin ensembles, dripping in jewelry and general ease. At such a display of overt wealth, Bermudian restaurants and boutiques -- whose Key lime, cerulean, and buttercup-yellow paint jobs would otherwise steal the show -- seem like an afterthought. A gaze out into the Great Sound, an inlet formed from the remains of a pre-Holocene volcanic caldera, reveals equally pristine multimillion-dollar estates, whose white terraced roofs sit gleaming atop them like crowns. Wait until the sun goes down, and the sweet life gets sticky. You'll overhear silver-haired investment bankers bemoan the advent of "PC culture" as they call their bartender "gal;" you'll watch transatlantic teens drop hundreds of dollars on booze as if it's pocket lint; you'll see 30-something finance bros gyrate feverishly under track lighting, as if to physically remind their youngish brains that they are still in fact human, not machine. Indeed, a night out in Bermuda is straight out of Wolf of Wall Street, made better or worse -- pending your perspective -- in that this world is absolutely real. To be fair, extreme wealth and exclusivity aren't exactly new to Bermuda; they've shaped the islands' form from the beginning. British settlers eked out a profitable cash-crop economy from the colony's outset, but when the Virginia Company more or less monopolized that trade, Bermudians stopped attempting to physically grow their wealth and shifted their sights onto siphoning it from others vis-a-vis piracy and privateering. Making great use of the one natural resource they had, cedar, Bermudians went all-in on developing the fastest sailboats they could, and quickly became some of the most fearful maritime raiders in the world. It's a reputation Bermuda still embraces: In May and June of 2017, it's going to play host to the America's Cup, the world's most badass regatta. 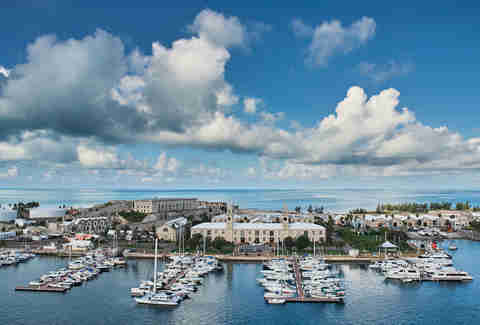 Over the centuries, the whole owning-the-seas thing worked out pretty well for Bermuda. These pirates and privateers used others' wealth to build their own paradise in otherwise inhospitable domains (there is no freshwater source in Bermuda, and the archipelago lies in the direct path of hurricanes). Over time, these early oceanic plunderers would pass that wealth on to their descendants, aptly called the "Forty Thieves." Over the centuries, the whole owning-the-seas thing worked out pretty well for Bermuda. Throughout the next two centuries, Bermuda's upper crust used this accumulated wealth and power to lord over the islands. And as you might imagine, they managed to do some pretty remarkable things with that power -- like maintain the world's tiniest working drawbridge, the Somerset Bridge. Settlers had that precious infrastructure installed in 1620. At a whopping 18in wide, it was just large enough for the sail of a single boat to slip through the gap -- and shave some time off the vessel owner's trip. Alas, the successful legacy of the 18in drawbridge didn't translate to Bermuda's attempt at a railroad, a 21.7-mile line abandoned in 1948 after 17 years of costly development. Today it functions as a bike path for people who view failed public infrastructure projects as sport. That's not to say that Bermudians don't have a sense of humor about themselves and their particular strand of bizarre. While on a morning bike tour of the islands -- it's the cheapest, most invigorating two hours you can spend here -- my guides said that Bermuda has a "hungover mentality" when it comes to just about everything, including the names for native flora and fauna. "If you look at a bird and think of the two most obvious words to describe it," my guide said, "you've probably guessed what we call it." Still, laziness doesn't quite get it right. 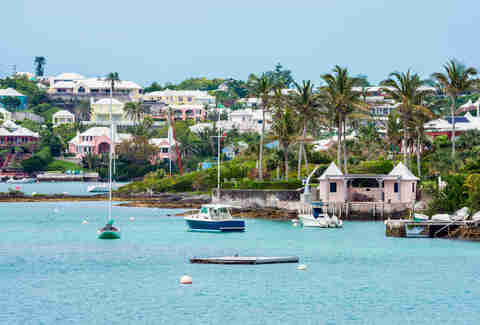 After all, over the course of a few centuries, Bermudians turned an isolated, barren island chain -- inhabited solely by pigs when the Brits arrived in 1609 -- into a bastion of and for global wealth. And as a consequence of eking out civilization in inclement conditions, it looks like Bermuda is here to stay, no matter what kinds of hellish futures climate change has in store. In fact, and perhaps counterintuitively, climate change might be the way Bermuda becomes a destination for more than the uber-wealthy. 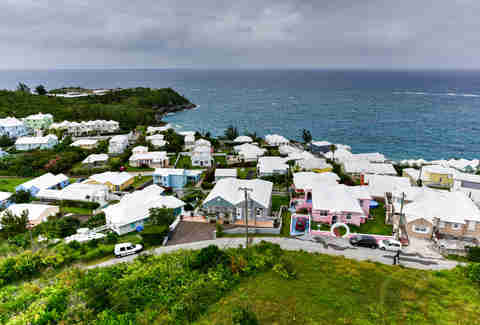 These days, the tourism spokesperson told me, people around the world look to Bermudians as experts in sustainability, and increasingly visit the island chain for tips on how to prepare for rising sea levels and volatile climate conditions. And the thing is, since Bermuda is such a pro at dealing with awful weather and limited natural resources, talk of climate change with an actual Bermudian won't leave you feeling defeated and deflated. They know what they're doing, and they're really excited to share what they know with anyone who wants to listen. On the bike tour, for instance, you'll learn about the islands' indigenous mangroves. Their latticework roots prevent soil erosion, and their "sacrificial leaf," which filters out and absorbs the salt from the ocean water, allows the rest of the plant to live. You'll also learn about a centuries-old Bermudian housing practice that if invented today would get some Scandinavian architect a TED Talk and a flock of design school devotees. Back before Bermuda had a municipal water supply, residents terraced and treated their roofs with a calcium wash to catch and clean rainwater for household drinking. Oh, and they built these roofs to withstand 300mph winds. Indeed, all the waterfront palaces you'll see in Hamilton are also functional nuclear bunkers. 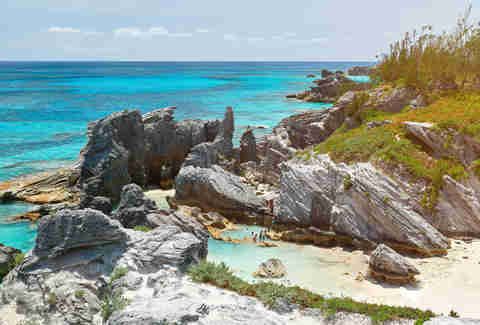 It's this blend of ostensible opposites -- sheer survival instinct and shameless self-indulgence -- that makes Bermuda unlike any other island destination you'll visit. 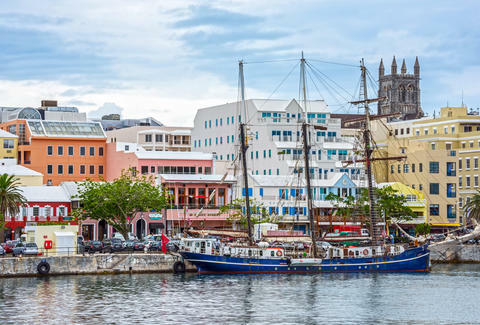 Locals will take you on catamaran tours of the islands, where they will spend just as much time talking about the square footage of Ross Perot's manse as they will the importance of preserving scarce global water supply in a warming climate. They'll offer you a third or fourth glass of sparkling wine while they go back and forth about the exact tax non-residents must pay if they buy a car, a purchase which they find extraneous. They'll call themselves lazy, when their surroundings, immaculate and impenetrable, present a reality of anything but idleness. It's a strange world Bermudians live in, and it's one that most of us just don't have access to. And yet, this world -- however isolated -- has much to teach us, in terms of how we got here, where we're headed, and who's steering the ship. If you want to scratch the surface of these questions in one spot, let Bermuda be your guide. Savannah Cox is a writer and editor in New York. She doesn't have a trust fund.